We keep hearing about this fancy NFC (near-field communications) technology that will allow people to complete transactions using their phones, but we have yet to really see it happen. Meanwhile, Square has released an app called Card Case, which basically turns smartphones into credit cards. Card Case is different from NFC technology--it's not really a credit card system, it's a tab system. Card Case allows customers to save their credit card info in the app, and then "start a tab" at a participating merchant. When the customer starts a tab, they are basically "checking in" to the business--their information, including their name, appears on the merchant's corresponding Square Register app. When the customer is ready to pay, all they have to do is say their name--the merchant will find it on the Register app, ring them up, and the transaction is complete. 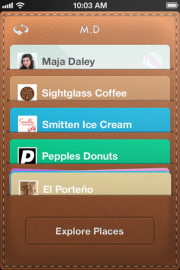 The Square Card Case app represents a virtual wallet. Even more convenient: Once the transaction is complete, the customer receives a virtual receipt saved in his or her Card Case, so there's no need for paper receipts. The app also features a directory of local, participating businesses, as well as menus and specials for each business. The app is currently available in five cities: San Francisco, New York, Los Angeles, Washington, and St. Louis (and in the latter two, there are only a couple of participating businesses). The app's implementation is a little curious; in order for customers even to download the app, they must first go to a participating Square merchant and make a purchase with their credit card. Once they've made their initial purchase, they'll receive a text message with a link to sign up for Card Case. After the first purchase, they'll be able to set up tabs at any participating businesses using Card Case. For SMBs, the Square Register and Card Case apps are a convenient way to process transactions, but they're not exactly a viable replacement for a good, old-fashioned cash register. First of all, not all customers have compatible smartphone (Card Case is currently available for Android and iOS phones). Secondly, not all customers pay with credit cards--and the Square Register app can't stash cash transactions (since your iPad can't store bills and coins). The Square card reader attaches to an iPhone or iPad. For these reasons, I can't see retailers embracing Square's app combo and throwing out their cash registers. But for businesses that make fewer, and more expensive transactions (and who have a smartphone-equipped, credit card-loving customer base), Square's Register and Card Case apps could be very handy. Square will be accepting tabs for additional merchants in the coming weeks, and you can sign up for more details here. Square also makes a tiny, plastic credit card reader that plugs into the headphone jack of a smartphone or tablet--just in case your customers want to pay with their credit cards, the old-fashioned way. The credit card reader is free, but Square takes 2.75 percent of each transaction. While Square's new Card Case app doesn't mark the end of the cash register era, it is a big step in mobile device transactions--until we see NFC implemented in a big way, it's the only app that really lets people pay with their phones. If you're a small-business owner or you simply need a better, cleaner way of accepting payments, this is the service and device for you.